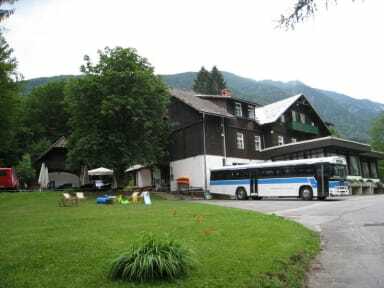 Hostel Pod Voglom with annex Rodica is situated at one of the most beautiful locations in Slovenia right next to the Bohinj lake in the Triglav National park and is ideal for the active holiday and the outdoor fans. With its capacity of 119 beds it is the biggest youth hostel in Slovenia and it offers 3 kinds of accommodation (rooms with private bathroom, rooms with shared bathroom or dormitory rooms- 4 beds in each dorm). Breakfast, bed linen and a towel are included. Travellers can relax at the hostel garden, swim in the lake, borrow some books or social games, watch TV, play darts, table football, billiards, table tennis and volleyeball, available free all the time. 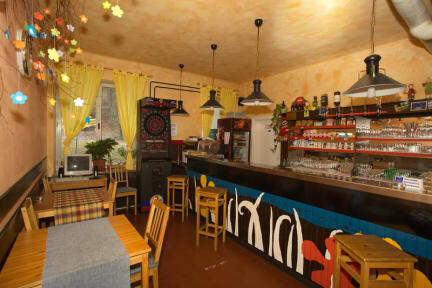 There is a bar and a restaurant in the hostel where guests can exchange their travelling experience and use the free internet. You can rent boats, canoes and kayaks or mountain bikes. Pac sports sport centre is located at the hostel, that is why an interesting challenge for those who want more adrenaline, is participating in high ropes course (in the yard of the hostel) or experience rafting, canyoning, hydrospeed, caving or tandem paragliding trip above the Bohinj lake. In the winter time guests can choose among activities such as snow rafting, day and night trips with snowshoes, winter paragliding, ice climbing, sledding or skating, organized by the Hostel Pod Voglom team. Ski centre Vogel is located about 3 km away, 5 min by car. Ski bus passes the hostel and is free of charge for all the guests. We offer our guests 10% discount on all the outdoor activities. In summer time (JULY - AUGUST) travellers can order dinner in our restaurant every day. In the rest of the season, restaurant is open only for bigger groups. Groups are welcome at Hostel Pod Voglom and there is projector, screen and flip chart available for the seminar purposes or movie presentations. Check in time: 15.00 - 19.00; check out at 11.00. - tourist tax (1,27 euro/person/night) is not included in the price and has to be payed in cash at the hostel! My favourite hostel to stay at! it is in Ribcev Laz and right next to the Pod Voglom bus stop so very easy to get to. It is right on the lake so the views are beautiful. There is no kitchen but breakfast is included and I ate very well. The bathroom and bedroom facilities are also clean and good. The atmosphere is lovely and most importantly the staff are very helpful. They kept breakfast open for me late and advised me on the weather conditions and cable car to Vogel, very friendly. recommend! Really great hostel in a really great place! It was easy to find and right on the lake. It’s very cozy and homey and serves a good breakfast in the morning included in the (cheap) price. They also offer a range of different water sport equipment for hire - guests receive discounted prices. Would definitely recommend! It's a really lovely place right in front of the lake Bohinj. I went with my sister and we both found it super comfy and inviting. The room was kind of cold, the heater wasn´'t turned on, so yeah, bit chilly. The staff is really friendly, super helpful, just the only inconvenience we encountered was that it is stated that the reception is opened from 8am to 10pm, and when we wanted to pay at 9:30pm and ask for some information, nobody was there. But overall, cute and inviting place. Great place to stay if you wish to have a cheap room close to the lake. They rent out mountainbikes, canoes and more at the premises at quite nice prices. Rooms are nothing special, but with breakfast included at that price it is tough to beat. All in all I can recommend if you using most of your time out of the room. Surrounded by nature. Soooo peaceful and quiet - when there were no kids around... friendly staff. Amazing breakfast. Clean, comfortable. Over the road from a nice place to sit by the lake. Nice 25 min walk to town. Our dorm room was quite small for 4 people. it felt like we were sleeping with strangers because beds were so close. It was a good stay. However the hostel is in the middle of nowhere and it only serves kids meal style school dinner food or paninis. Therefore we struggled with dinners. However it is right on the beautiful lake so if you like ruralness this is perfect. Bedrooms are satifactory. But good value and you get what you pay for. In the evening there is a bar and a nice area to sit and chat with other guests. Good if travelling alone. It was a lot of families staying at the hostel. I left a day early because of this. One shower and one toilet for the whole floor ! Both were quite small and unpractical. Mold seems to be normal in hostels, but I still consider it as dirt. The light in the corridor didn't work and the staff was unable to send me the bus schedule, as I wanted to know beforehand , how and when to reach the hostel from the next village. There were only paninis to eat in the evening ( not suitable for veggies or vegans ) , the next restaurant was a good 25 min walk from the hostel.